In a large bowl, combine 2 cups flour, yeast, sugar and salt. Make a well in the center and pour in the olive oil, warmed beer and Smoky Garlic Mustard. Stir until combined. Stir in just enough remaining flour to form soft dough. Turn dough onto a floured surface and knead until smooth and elastic, about 5 minutes. Place in a greased bowl, turning once to grease the top. Cover and let rest for 20 minutes. 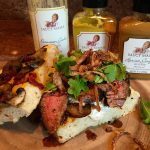 While dough is resting: Marinate ribeye steak (see below), then make SAUCY MAMA Spicy Sandwich Sauce (see below). Preheat oven to 375’. Coat a 13 x 9 x 1 inch baking pan with cooking spray; and sprinkle with parmesan cheese. Punch dough down. Press into prepared pan. Cover and let rest for 10 minutes. Top with Saucy Mama Smoky Garlic sautéed mushrooms, spreading evenly over dough. Bake for 20- 25 minutes or until golden brown. Cool in pan for 10 minutes; then remove from pan to a wire rack until time to assemble sandwich. Melt butter in a large frying pan. Add sliced mushrooms and sauté over medium heat, stirring occasionally, until liquid has cooked out of mushrooms and they have begun to brown. Stir in chopped sun dried tomatoes and SAUCY MAMA Smoky Garlic Mustard. Simmer for 5 minutes. Remove from pan and set aside to cool to room temperature. NOTE: Cook mushrooms and let cool to room temperature before starting focaccia bread. In a large glass Pyrex pan coat steaks with SAUCY MAMA Parmesan Garlic Marinade. Let them marinate for 30 minutes. Heat grill to medium-high heat. Cook steak to medium-rare, turning once; approx. 5 minutes per side depending on the thickness of the steak. Note: Watch carefully that they don’t burn. Remove from grill to a platter. Cover with foil and let rest for 10 minutes. NOTE: While grilled steak is resting, make Crispy-Fried-Shallots. In a small bowl mix together sauce ingredients until blended. Store covered in the refrigerator until sandwich assembly time. In a frying pan, heat one inch of oil to 375’. While oil is heating: thinly slice shallots and coat evenly with flour. Fry floured shallots in batches in hot oil to avoid crowding. Fry until deep brown (done right before they hit the burnt stage). Remove with slotted spoon to a paper towel lined pan and sprinkle with sea salt. Set aside until assembly. 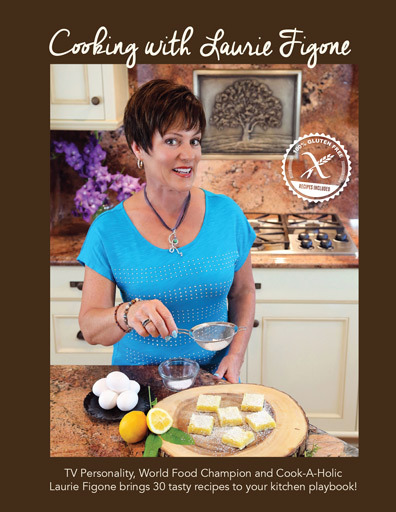 Slice focaccia bread in half lengthwise and then each half into 4 equal slices. Coat one side focaccia bread (mushroom side) with SAUCY MAMA-Spicy-Sandwich-Sauce; dividing the sauce evenly between 4 of the slices. 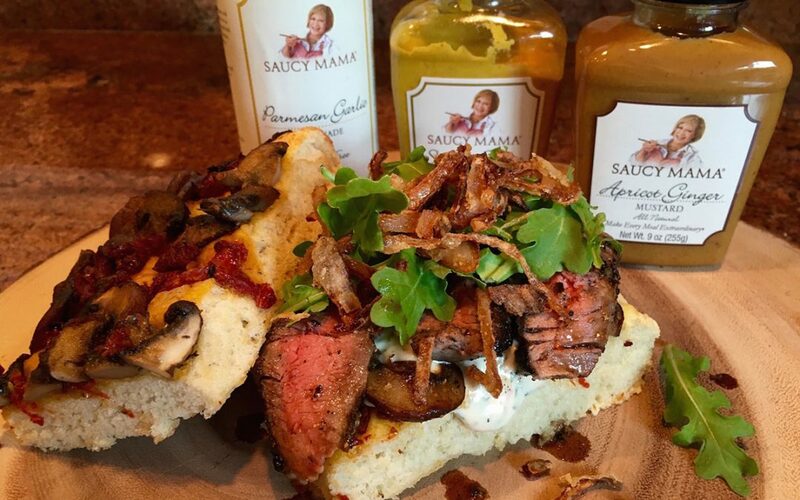 Slice the SAUCY MAMA-Parmesan-Garlic-Grilled-Ribeye-Steaks into ¼ inch slices and divide among the 4 ‘sauced’ slices. Top the steak with Crispy-Fried-Shallots; dividing among the 4 sandwiches. Next layer on the baby arugula. Finally, top with the other half, mushroom side down (parmesan crust is on the outside). 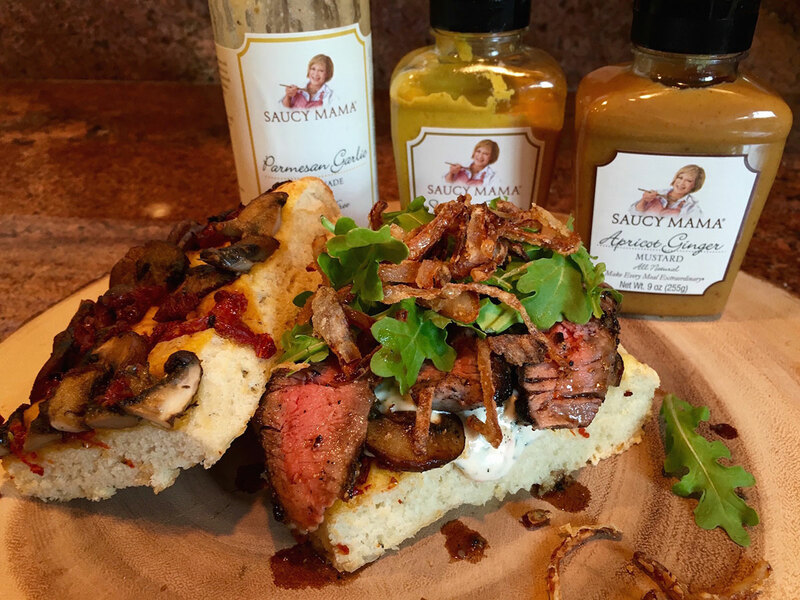 Grab the napkins AnD get SAUCY…MAMA!! !